I often find myself looking for substitute ingredients while I am cooking. That is when it hit me, I have to make my very own Exfoliating Face Scrubs! Now I can make sure that there are no harsh ingredients or preservatives or chemicals that I cannot even pronounce. With these 10 simple homemade exfoliating face scrubs you can be in control on what goes on your skin…besides, you might already have most of the ingredients in your pantry! Let’s roll! This Almond & Honey Face Scrub by Clones N Clowns is a face scrub that is a favorite of many. It is a simple and natural way to pamper your self for that well deserved me-time! The Sugar-Lemon Scrub by Crafteberry Bush must smell delicious!! This scrub contains coconut oil which contains vitamins and nutrients which nourish and moisturize your skin. And along with the lemon and sugar, this scrub will leave your face moisturized and smooth. 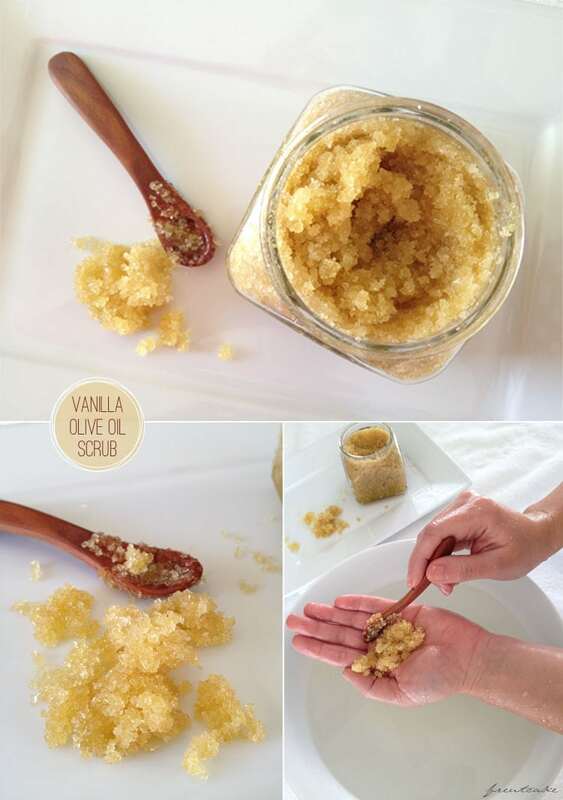 The Vanilla Olive Oil Scrub by FreutCake will leave your skin silky and smooth. What is best is that you can use this scrub all over your face and body to keep your skin healthy during the Fall and Winter season. 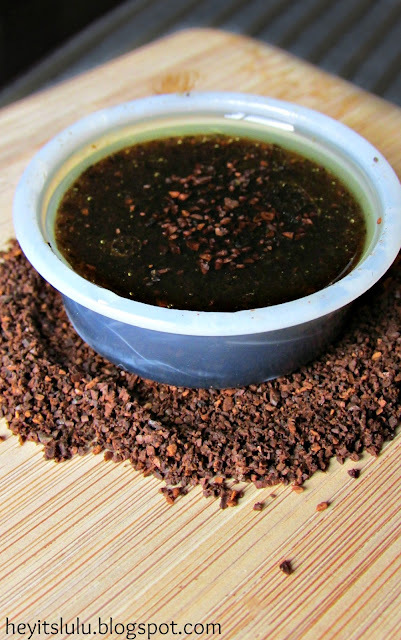 The Coffee Face Scrub by Heyitslulu has to be hands down the best face scrub ever…it has coffee in it! This is one I am seriosuly looking forward to trying out. 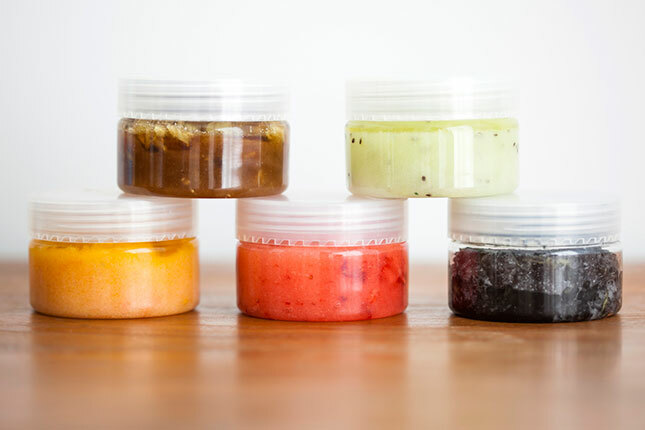 Misty @ Brit + Co. came up with 5 Homemade Face Scrubs for Every Skin Type that you should definitely try out. Her face scrubs exfoliate, tighten, moisturize, and bring heavenly smoothness to your skin. The Amond & Oatmeal Face Scrub by Pretty Frugal Living is easy to make. All there is to it is grind the ingredients and add a bit of water/milk to form a paste. This scrub will slough away grime and dead skin in a natural way. This Baking Soda Face Scrub by No. 2 Pencil will surely bring your dry skin back to life. The texture of this face scrub is perfect for all skin types since it is not too rough and not too fine. Quick and simple. This Homemade Facial Scrub by Go Hippie Chic will clean as well as tighten your skin thanks to its main ingredients: pumpkin, lemon and coffee. Which is your favorite exfoliating face scrub? Almond & Honey has always been the best combination for my skin-whether it be soap or scrubs. I never thought of making it myself–what a great idea! I love face scrubs, particularly interested in the pumpkin, lemon, sugar scrub! I think that the lemon & sugar scrub would smell wonderful but everyone says that a coffee scrub is great for your face. I, unfortunately can not use a scrub on my face……it’s sensitive skin just doesn’t work well with soap let along facial scrubs even though I do love them. I have always wanted to make my own scrubs but never gotten around to it. Love these recipes, the one with the pumpkin sounds lovely. I’ve always wanted to make my own, natural, scrub! Thanks for all the recipes to make them! oh, la la. i love love love a nice facial scrub. being able to make them here at home is even better!! I’m definitely pinning this. Great resource for homemade scrubs. It’s so easy to make, and I love that the ingredients can be found in the cupboard. Great recipes! I love scrubs…will be pinning these 🙂 Possible Christmas gifts? And with homemade you know you are not adding chemicals! Exactly!! And the ingredients are things you already have in your pantry, super easy and natural. Wow! That’s probably my favorite post so far 🙂 I love homemade scrubs! I am using it all the time so will be nice to try something new. So far- the one with coffee is my favorite. Really good and smells- delicous. 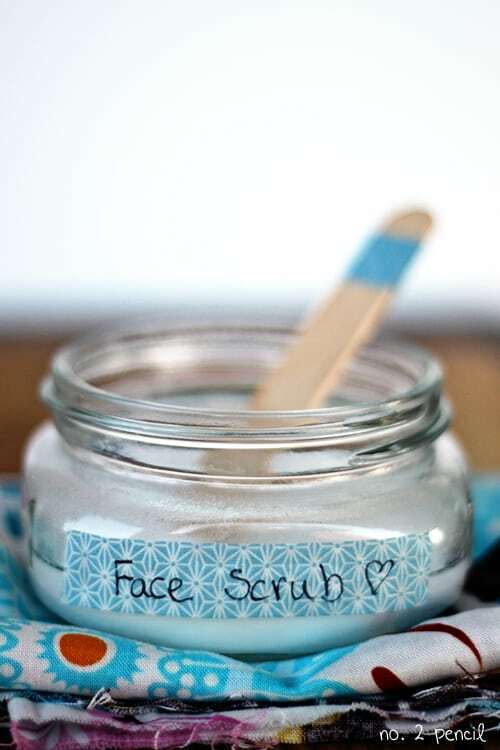 I love the homemade scrub i definitely have to try and make some,i am not sure which scrub will work for my skin but its definitely time to try it out…thanks this is a great list. Such a good idea to make your own, and packaged pretty they are the perfect gift for teachers (or most anyone) too! Those scrubs looks great! I’m going to try the vanilla olive oil scrub! 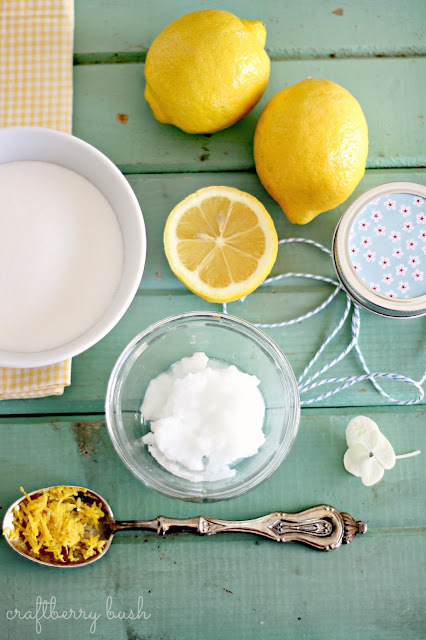 I want to try the lemon and sugar scrub. Thanks so much for sharing. I love scrubs and I love the ones that are homemade! It really does a great job at clearing your skin! The pumpkins scrub I will have to try. I have never tried that one before. Thanks for sharing! Just what i need! there’s too much media events to attend and buffing really sets the mood. I do the olive oil vanilla sugar glow but can really use that lemon scrub as well. I will try this come weekend. Thank you for sharing! I just got a grape seed exfoliating scrub and it is awesome! I would love to try out these other ones too! I need to try the vanilla scrub one day!